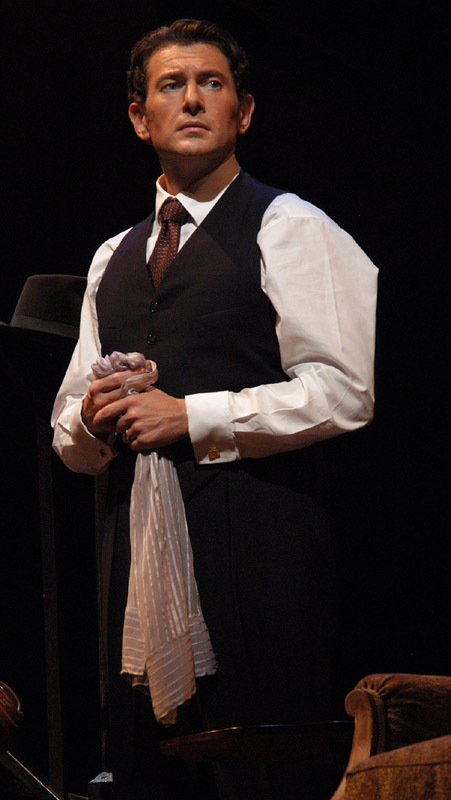 Brett Polegato as Figaro in Vancouver Opera's 2003 production of The Barber of Seville. While Brett Polegato was in Seattle for Madama Butterfly a few weeks ago, Seattle Opera's Communications Editor, Jessica Murphy, got to sit down with him to look ahead to next season and ask him about Dandini, the character he'll sing in La Cenerentola, and the amazing entrance aria he'll sing halfway through the first act, "Come un'ape." Brett had plenty to say about this aria, which he loves, about our production, which he has previously done in his hometown of Toronto, and about playing comedy seriously. Why does Dandini sing this aria? In the drama, my boss--Prince Ramiro--is disguised as me, his valet, and wants to scope out the joint. Because he has to get married, he wants to observe the women in his kingdom without them knowing that he’s the prince. So he’s said, “In just a second the prince will be here to meet all the eligible girls.” That’s when I come in and I pretend to be the prince. Dandini sings this because it’s his first opportunity not to be a servant...normally he’s the Prince’s servant. It’s his chance to be bigger than life, to imagine how he would behave if he were prince. It is. You have to have a great deal of energy. It’s almost a Broadway show tune; it’s really an advertisement for the prince. So it’s just fun, like a big dance number. The chorus and the other characters also play an important part in the second part of the aria, singing along, so it becomes like a big chorus line by the end of it. It’s all about you, a commercial about how great you are: I can do anything! It doesn’t move the plot forward; it really is about dazzling people. William Burden as Pylades (left) and Brett Polegato as Orestes (right) in Seattle Opera's 2007 Iphigénie en Tauride. Is it hard to sing? It’s very demanding, because it has to sound easy. It has to sound fun and comic. But like a lot of Rossini, with fioratura and coloratura, it’s technically quite difficult. Like many of the heroic arias it’s split into two parts. There’s a slow, beautiful section and a fast section; in the slow section there are a lot of runs and a huge range and changes in vocal phrasing--a legato passage and a passionate moment. And then the fast part is extremely wordy, it has a huge range and there’s not a lot of opportunities to breathe. It’s unusual for a character of Dandini’s stature to have that type of aria. Think of Figaro’s “Largo”—that’s just fast all the way through, very talky, not a lot of coloratura. Stylistically it doesn’t change very much, whereas the Dandini aria incorporates everything. Your character is in disguise. Do you have to reflect that disguise in your singing? That’s always a hard thing in opera because it can come across as very put on. The good thing about this is that no one in this scene knows either the prince or Dandini, so neither of them has to disguise their voice--no one would know what they would sound like. But Dandini does have to sing with different voices in that there are moments when he is talking to Magnifico and his daughters mixed with these asides to the prince: “Look at them, these two daughters are really ugly!” or “Am I doing a good job?” For those you have to make sure the audience knows you’re not being presentational. 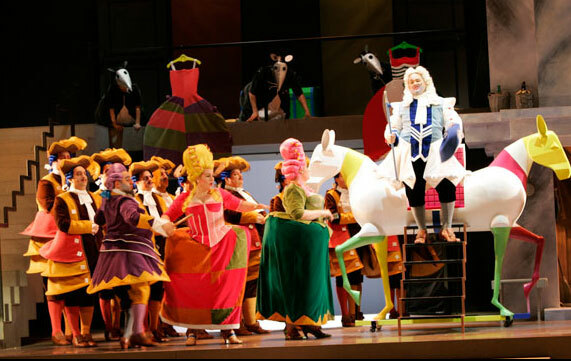 These sets and costumes for La Cenerentola, pictured here at Houston Grand Opera in 2007, will be seen in Seattle in January 2013. What’s it like to sing a huge aria upon your entrance? I’m sure you have other roles in which the audience has had a chance to get to know you a bit more before you sing the big aria. Yes, although I like this one because…first of all, it’s a great entrance. 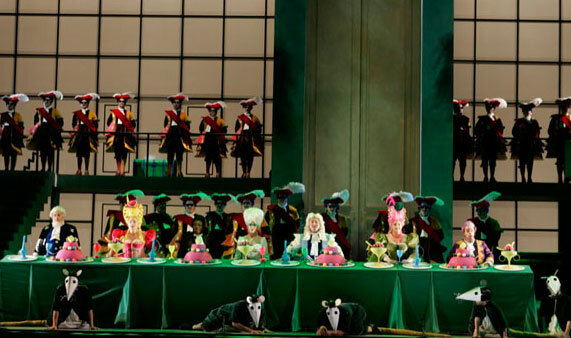 I did this production before, in Toronto, it’s wonderful, over-the-top, you are immediately likable--even more so than Figaro in his entrance--because immediately the audience sees you having so much fun. Apart from the ugly stepsisters, who are funny in a different way, Dandini is the first identifiable character; he’s very much like the audience. He really has nothing to lose in this story; from the outset he knows when this day is over he’s going back to being a servant. So he can say whatever he wants because he has nothing to lose. He’s quite forthright with the prince (sometimes when other people are around, so the prince can’t chastise him). It gives Dandini a chance to be frank about things he maybe wouldn’t do or say otherwise. It’s a wonderfully fun production. Very colorful, and it captures the fairy-tale aspect of the piece. It’s not a cerebral experience. It’s very entertaining. When we did this in Toronto, there were kids in the audience 5 years old and up, and they loved it and laughed. While Barber is funny, the people are quite mean. In La Cenerentola the humor is not quite so malicious. I find it a much more charming piece overall, and the ensembles are great. There’s a wonderful ensemble in the second act, in which everyone is terribly confused, and Rossini just uses rolled Rs and percussive Ps to make it musically funny. 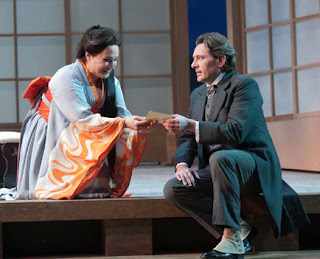 Brett Polegato (Sharpless) with Patricia Racette (Butterfly) in Seattle Opera's May 2012 production of Madama Butterfly. 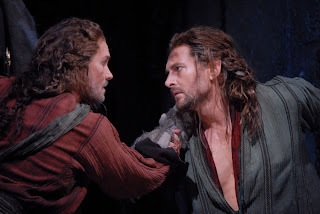 Which is harder to perform, comic roles like this one or serious roles like those you’ve done on our stage up to now? I get asked to do comedy a lot but I think by nature I am a more serious person so I gravitate toward more serious roles. If I get hired for comedy, maybe it’s because I play comedy quite seriously, and people find that funny. Just taking people at face value in comedy seems to be hysterical sometimes. Can you give us an example of how you might work out a funny moment for an opera comedy? Many people who do comedy come with a bag of tricks they insert. For me, though, comedy just comes out of the scene. I remember one time doing Rossini’s L’italiana in Algeri and there’s a moment when one of the characters says to me, “When I sneeze, that’s your cue to exit.” But my character doesn’t do what he’s supposed to do. This was totally spontaneous, and I didn’t even think it was going to be funny, but the character says this, and sneezes, and I reached into my pocket for my handkerchief, and the audience howled with laughter. I didn’t do it in a comic way, I did it in a very honest way: “Oh, do you need a hankie?” It just comes out of being aware of what your colleagues are doing onstage. What should someone who has never before heard this opera be listening for? One of the reasons I love singing Dandini is it really is a true Rossini coloratura role. Many people who know The Barber of Seville think Figaro is a role that requires tremendous technical agility. It really doesn’t, it’s a patter role from start to finish, whereas Dandini is required do everything, and all in this aria. It’s fun to be able to do a comic piece and still have it be vocally challenging. It keeps you on your toes! Would you say that it’s usually easier to sing comic roles than serious ones? A lot of comic roles for baritones and basses tend to be very syllabic, very wordy and talky (or barky!). They don’t allow for a great deal of beautiful singing. Dandini does; there are some really beautiful moments. In fact, the people with the most coloratura in this opera are Cenerentola and Dandini, both of them servants. 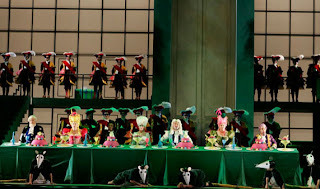 I think Rossini felt much more connection with these more human characters than he did with the pompous father or the magician or the prince. 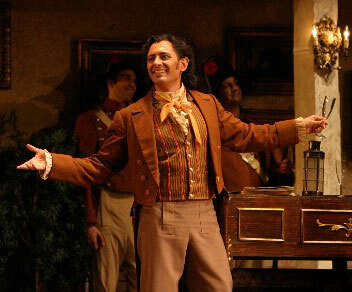 La Cenerentola at Houston Grand Opera in 2007. You sing the second half of this aria as an aside.